As with any product or service, it is beneficial to be an informed consumer and do your research. To assist with your decision making regarding resurfacing over other forms and options for updating your fixtures, we have outlined some of our most frequently asked questions, and then some. Should you still have any questions or concerns which have not been listed below, please do not hesitate to contact us and we would be delighted to address them with you. We can also add them to this page to assist other consumers with your same queries. Q. How long does a bathtub take to be resurfaced? A. 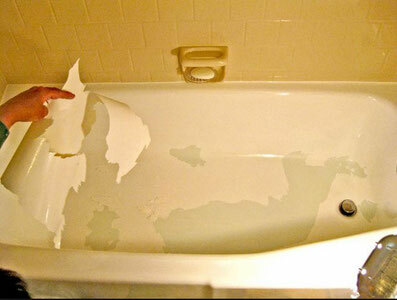 The approximate time it takes one of our expert resurfacing technicians to resurface a standard bathtub is 2-4 hours. If a bathtub has been previously refinished with inferior products and requires stripping, anywhere from 45 minutes to 4 hours can be added onto the time it takes to refinish a tub, plus an additional set fee for the stripping process. Surrounds, tiles and sinks can add onto that time but under normal circumstances we will finish the job in less than a day, with the finish being ready for use the following day. Q. Can I buy the products at my local home store? A. No. The products and DIY epoxies sold at home stores do not compete in quality or durability to the standard of those which professional technicians use on jobs. Licensed reglazing professionals have many choices of product to use: epoxies, car paint, marine paint, even aeronautical coatings, as the coating that they rely on to represent their company... point being that all chosen finishes are far from the DIY kits sold in stores. The products which we use are silane based with aliphatic acrylic urethane top coats, which require ordering and shipping from one of a select number of US chemical companies, which sell them only to licensed contractors. We work with a chemist from the manufacturer, to keep up to date with the newest and most eco-friendly, VOC compliant products on the market, applied with specialized industrial equipment. 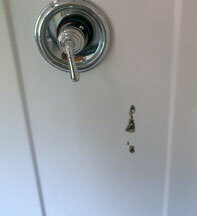 Pictured below is an actual client DIY product fail, before we stripped it all off and prepped the tub for our finishes. Inferior products mixed with inexperienced individuals, will not produce professional results my friends. Q. How soon can I use my tub/shower? A. You can enjoy a shower in your sparkly new looking tub or shower stall the very next day. If the area is caulked the day of refinishing, it will have a water tight seal setting over night, leaving it ready for use as normal within 24hrs. We do not recommend putting tape guidelines for caulk on any new finish before the 24 hour period marked on the client receipt. If the homeowner waits until after the entire cure process to apply a caulk seal, the shower stall will be ready for use as per the directions by the caulk manufacturer on the packaging. A. Even the smallest chip repair jobs require drop cloths and taping off areas. We do our best to minimize the chances of any damage occurring to your property or belongings however we do also appreciate a customer moving their personal belongings and bottles etc. from the work space. You do not need to clean your surfaces before we arrive. Our eco-friendly VOC compliant products are far superior in strength to those available in stores, therefore we will give your surface a deep clean via a multi layering process when we arrive. However as with all surfaces, any leaks from faucets or drains can damage a finish during its cure time. It is important that any necessary repairs be made prior to bathtubs, sinks, shower stalls, whirlpools etc. being resurfaced. Likewise with other remodeling in the room, to ensure no debris, dirt or tools fall into the new finish. Failure to do so may will a null warranty. We like to come in after the contractors have used the tub for storage or standing on and be the finishing touch to your bathroom! Q. What if I have no window in my bathroom? A. No problem, unless you live in a dungeon. We use a ventilation system while we are working, to direct all air-born particles off premises via the closest window. As standard, we carry a 25ft hose, and also a 50ft hose for those areas where we work with no exterior windows in the room, to ensure that the fresh particles are always being removed. The smell dissipates with use (ready for use after 24hrs) and of course ventilation, but under normal circumstances there should be just a faint smell in the room after a few days. We recommend fans rather than heaters to those with no windows who wish to speed up the process. Q. Can I use my bathroom while my tub is being refinished? A. For your safety, no. Our resurfacing technician under normal circumstances should only take less than a day to resurface your bathtub or shower, but will require a full day to complete a full room or multiple surface request. Resurfacing requires specialized products, equipment and clothing and once there, your bathroom is unusable to those not properly prepared. You can use your toilet basin once our expert resurfacing technician has left but you must refrain from using any water on the bathtub, shower or sink that has been resurfaced until 24 hours afterwards. The combined preparation, repairs and finish require a certain number of hours to become cured, set and sealed water-tight. Failure to heed to this caution may require a repair job not covered by our warranty. Q. Can you come out for a small repair job? A. Yes. Unlike franchise companies with large overheads, our family business can afford to make house calls for minor repairs. Chips, old shower door holes, scratches, rust spots.. With our color matching technology and skills combined, we can make any minor repairs necessary to your fixture and blend the area into the existing finish so its is close to, if not invisible with the naked eye, if you do not wish to have the entire fixture refinished. It is recommended for durability, to have an entire piece refinished after repair work has been performed, but it is not necessary. Q. What are your hidden fees? A. If we have provided you with a quote, it is likely based on either a description of, or a trip to the area. Our quotes are almost always steadfast unless the scope of the work changes or is not as described upon arrival on appointment date. A possible example of this can be stripping of prior inferior surfaces. Some property owners are unaware that a surface has been finished before and some simply forget to include it when inquiring about pricing, however stripping of inferior surfaces is a necessity to ensure that our products adhere to the original finish for maximum effect and durability. As we do not provide caulking on the day of service due to the wet finish, it is an extra fee if you would like us to return the following day to caulk in your edges for you, which can be discussed with the technician on the day of service or at scheduling. (However see below how easy it is to do it yourself for the price of a tube of caulk!). A possible other fee might be if the area is not ready for our services when we arrive. For situations such as this we may charge a trip fee and will need to reschedule the appointment. Any coupons, promotions or memberships should be mentioned at the time of estimating and scheduling to be applied and cannot be claimed after work has begun. Clients wanting cabinetry resurfacing can save some money by removing all hardware themselves, prior to our arrival. Otherwise a removal fee is charged per cabinetry unit (single or double door unit) or drawers. Psst! Check out our Current Offers page if you are thinking of booking with us, to see if there is anything going on that you could avail of! Q. Do you issue refunds? A. Any refund offered by Dennie's Resurfacing LLC, is at the discretion of the company. Refunds may be offered after repeated attempts, appointments, inspections and/or full or partial warranty issues have been dealt with to the dissatisfaction of both the individual signing the work contract and the company. No full refunds are given due to company time and efforts needing to be taken into account. In legal accordance with CRFA 03.14.2017, our paperwork states the following: "Please read carefully before accepting this courtesy refund. As part of this agreement, accepting this refund signifies that all disputes and claims about or out of the above referenced contract are hereby satisfied, released, discharged, settled and resolved in all respects. Upon acceptance, terms of the settlement, refund, discount or services received may not be discussed with parties outside of those named on the contract outlined to include, but not limited to reviews on the internet, social, published, printed or broadcast medias. Dennie's Resurfacing LLC reserve the right to seek legal compensation for violations of these terms automatically agreed to upon acceptance of the above listed courtesy refund." Q. What if I need to postpone or cancel my appointment? A. No problem. If you need to either postpone or cancel an appointment, it is no problem at all to do so before the day of service by contacting us at any method listed on our Contact Us page. We have a very full schedule, typically for 2-5 weeks in advance, and can assist other clients at your appointment time if you need to reschedule. However if postponements or cancellations, also in the form of missed appointments whereby our technicians cannot gain entry to the property for any reason, are made on the day of service or at the scheduled time, we may charge an inconvenience fee. All fees incurred are at the discretion of the company and billed to the individual responsible for the missed appointment on the original contract page, or respectfully added to the ultimate bill at the rescheduled time of service. Q. What is countertop resurfacing? Q. Do you offer credit or financing? A. Yes we do! Enjoy your newly resurfaced fixtures now and pay at your convenience. As of January 2014 we have partnered with FlexPay Plus to help you finance your projects. Click here for more information. Q. Why is my caulk moldy? A. Depending on the manufacturers brand and durability of your caulk or sealant, your caulk may need to be removed and reapplied if it gets moldy over time. Not only does it look unsightly, but it harbors bacteria and germs. Many search results will appear when you look up how to remove caulk, and once you pull it out, the image below is the method we recommend to our clients for reapplication. The performance of caulk and silicon sealants are not the onus of Dennie's Resurfacing LLC. If the replacement of caulk is not something you would like to handle, you can definitely give us a call to come and take care of it for you. A. The image below roughly describes our service area and extended service area. You can text us with your inquiries at 484.554.1807. Q. Why is there no pricing online? A. We use standard pricing to begin with, based on the service areas seen on the map above. However a 'standard bathtub' is different to each individual consumer - 0, 1 or 2 bathtub walls exposed, 2 or 3 wall surround, 3/4 height surround or tub to ceiling tile surround, enclosed tub surround.. Likewise with tiled bathrooms. We require square footage to be able to provide a quote for work to be done. A description of 'half wall tile' only tells us a little of what we need to know to be able to help you. Sinks require pictures for quotes as again, sinks vary so much in size and shape, making it difficult to estimate firmly. We have no pricing online as we require more information to be able to confidently quote a project for our clients. All too familiar with other company's 'bait and switch' tactics, we try to be fairly steadfast with our estimates, unless the scope of the work changes upon arrival. Q. How long will the new finish last? A. With resurfacing, your fixtures get an extended lifetime of 10-15 years with proper care and maintenance. This is variable however not only with care and maintenance, but the location and use of the fixture/ surface. Naturally a daily used fixture like a kitchen sink will receive more wear and tear than one in a guest bathroom for example, or likewise, horizontal tile being used on a floor or countertop as opposed to vertical wall tile which can last indefinitely. See our video with a durability test on our floor products. Only the highest quality industrial eco-friendly VOC compliant products are applied using HVLP turbine equipment, whose guarantee combined we operate under. In normal words, we spray high quality stuff! Professionally resurfacing fixtures outlasts any paint, epoxy, DIY or home project kit available in stores by years, and surpasses their finish in presentation and quality. Be sure to ask your refinisher what products he is using, if you do not choose to hire us or are outside our service area. A. Yes. We are so confident in our workmanship and our products that we stand by an extensive written warranty for both residential and commercial properties. Warranty's range from 1 year to 5 years depending on the fixture, it's condition and location. Should you have any questions about our processes or the products we use, just give us a call. It is important to read the Care and Maintenance cleaning guidelines before using a newly resurfaced fixture so as to keep in compliance with your warranty. Be wary of individuals or companies offering 10 year warranties. A limited number of call outs is usually in the fine print whereas we at Dennie's Resurfacing LLC can come to your property an unlimited number of times in that 5 years until you are a satisfied customer. Some great clients reviewed us after they needed to avail of their warranty, if you haven't already been to our testimonials page and read through our reviews. Do contact us before attempting any repairs to ensure that we can honor our warranty to you. Warranties are honorable to the contract signor only. We do not shy away from warranty issues so if you have contacted us and have not received an answer from us, call or text 484.554.1807. We love happy clients! Q. What is a Slip-Resistant Surface (SRS)? A. SRS is a system which Dennie's Resurfacing LLC uses whereby there is no longer a need for non-slip suction cup bath mats or decals in your tub or shower stall. We use an ingenious system where we incorporate an invisible slip-resistant section into the final finish on the base of your fixture, heightening safety and not forgetting to mention the aesthetics of your fixture. Different shaped sections available, hand created to the shape of your fixture, blended into the color of your tub or shower stall. Goodbye bath mats! Q. Why should I choose resurfacing over my other options? A. While other options extort thousands of dollars from homeowners and astronomical fees for commercial properties, we are proud to be a company to offer affordable resurfacing solutions to you. From our company marketing, public research data analysis and by talking to you, the public, the homeowner, we have designed a simple yet informative chart to outline our findings. Q. Is there anything you need before you arrive? A. To perform our work, we require a power source, reasonable heat, a source of running water and a window nearby for ventilation. If other renovations or work is being done in the room or nearby, it is best to have those projects finished before we come in to ensure that no workman drops tools or anything of the sort in the tub, which would not be covered by our warranty. We often get asked about the order of work in a bathroom and we like to be in after projects such as new tile work in case of damage. As bathrooms are generally small, we ask that other project tools and equipment be removed from the area before our arrival, likewise with construction dirt, mortar and dust as they can affect the finish. Failure to follow these guidelines can result in a postponement of the appointment and a possible trip charge. Q. I think my tub was refinished before? A. No problem. If a surface has been previously refinished, it is likely an older or inferior product fail or improper equipment or craftmanship during the application process. Many of our jobs in fact, are the repair of older failed refinished jobs, some even being more recent repair jobs from home store roll-on application products with no durability. Any failing surface requires stripping and preparation before Dennie's Resurfacing LLC begin our process. Stripping a tub usually adds on a minimum of an hour or so to the finish time as well as the increased labor, and therefore incurs additional costs. Q. Are the products used harmful to my drains? A. No. Unlike older products or alternative products used by other refinishers, the products that we use today are eco-green products being approx. 90% waterbased. This means that any active ingredient in the solution becomes deactivated upon contact with more water. Therefore, the solution will flow through your pipes once the faucet is turned on with no damage being caused. Some companies may in fact use this threat in their product comparisons, but it is simply an empty threat. Q. Is the smell harmful to pregnant women, infants or the elderly? A. Probably maybe, so we just say Yes to be safe. The smell of the coatings is the strongest on the day of service and then dissipates daily with ventilation and use. We use a ventilation system while we are working, to direct all air-born particles off premises via the closest window. As standard, we carry a 25ft hose, and also a 50ft hose for those areas where we work with no exterior windows in the room, to ensure that the fresh particles are always being removed. The smell dissipates with use (ready for use after 24hrs) and of course ventilation, but under normal circumstances there should be just a faint smell in the room after a few days. In cases where there are individuals sensitive to the smell, some clients plan to stay with family for a few days, and some even schedule it together with their family getaway so that the work is completed when they get home. Helpful tip! After the 24hr dry time, if the smell is bothersome, wash the finish down with a soft sponge in a vinegar and dish soap mixture. Finish it all off with a towel dry and see the shine! Q. Is my tub or tile too old and damaged to be renewed? A. Probably not. It is a common misconception that rust, cracks, chips and flaking make a tub or tile irreversibly damaged. However with our expert resurfacing technicians being backed by the highest quality products and using professional precision tools, most tubs, no matter how damaged you may think it is, can be restored to its original beautiful elegance. Most common types of abuse to tile can be repaired, and with resurfacing tile is given a brand new and durable coat of synthetic porcelain, sealed water-tight. We even know a guy who specializes in grout services if you need some work done there too! Q. I’m not sure what kind of tub or sink I have? A. No problem! If a tap on the side doesn't let you know if it is fiberglass/plastic or cast iron, we can assist. Give us a call to set up a free consultation at your convenience and we will come by and answer any questions you may have. Not fast enough for you? Snap a picture on your phone and text it to 484.554.1807. We have products and processes for all kinds of surfaces - Porcelain, metal, steel, cast iron, ceramic, fiberglass, plastic, even wood and marble. 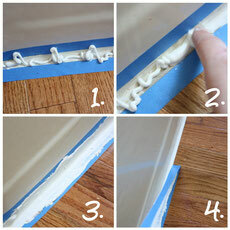 Apply painters tape to the width of strip desired. Apply caulk and smooth along with finger into any dips or holes to ensure water tight seal. Pull tape when wet and voila! Q. Can you fix old claw foot tubs? A. We love claw foot tubs! Not only do we fix them, but we save them from the dumps and make things out of them! We repair and restore them, both in place in your home, or in shop, to any color or finish you like! We can even hand paint a design or mural of your choice on there before adding the final layers of seal coat. We use the highest quality products which when coupled with our expertise, produce the highest quality finishes. Truly one of a kind, custom colored, real antique pieces of art. Yours. Q. What items can you restore? A. If it is made of cast iron, metal, porcelain, ceramic china, steel or most other surfaces that rust or discolor, we can probably restore it. While we do not deal with original electrical or mechanical components, we can definitely repair and resurface the body or shell of the item. Items we have previously restored include refrigerators, ice boxes, gas pumps, war items, radiators, grills, vintage fans, blanket trunks, original radio cabinets, motor cycle and auto body parts, milk canisters, vintage kitchen appliances, even garden railings and statues... and the list continues with each work day! Solid colors and hand applied art, we love to restore old things! If you are unsure if we can help you with your piece, just text or email us pictures of the item for a quote. It can be brought or shipped to us in Bethlehem PA.
Q. Do you buy claw foot tubs or old sinks? A. If you have an old tub or other fixture, contact us before you send it to the dump! We would hate to see an original fixture that is completely salvageable be destroyed forever! We love to refinish not only antique bathroom fixtures, but older kitchen appliances and porcelain signs, coolers or most things that rust. If you have a tub or other fixture that you need removed, contact us. If you are selling a tub, we are experienced collectors and therefore will offer fair reseller prices for what we see based on many factors such as manufacturer, date, size, feet, plumbing fixtures... We also have a Donate for a Cause program where we work with local non-for profit causes and charities with the profits from your donation. Contact us before you throw out that old thing! Q. How can I get my piece to you? A. You have 3 options. You can bring it, you can ship it, or you can contact us for pick up and drop off fees. We can help you unload and load your piece while at our facility. At this time we do not have a fork lift/pallet jack. We are located in Bethlehem PA. Check us out on the map on our Contact Us page. A. Yes we do! We regularly ship items to all states, with some international sales too. Shipping fees are as marked or agreed upon depending on the situation of the sale and the item being sold. Antique and vintage items require appropriate packaging materials, from a bubble wrapped envelope via USPS to a custom crate with interior packaging via LTL ground shipping. All prices are relevant, fair and agreed upon by all buyers before sale. All items must be inspected upon collection, drop off or upon receipt via shipping methods as there are no returns on antique and vintage item sales. Q. How long does a typical restoration take? A. Each piece is separate. Some pieces such as bath tubs require exterior sand blasting which adds to the return time, whereas some pieces such as war items/relics require just an in-house dismantling and sanding. Each piece has equal priority and is restored as per the contract, in the order of which it was received. Turn around time is wholly based on the current order volume, being anywhere from 1-8 weeks. Q. Do you sell claw foot tubs? A. Yes we do! We are very proud of our ever-changing collection of antique tubs by so many great early manufacturing companies - Standard Sanitary Mfg. Co., Ahrens & Ott, J.L. Mott, Kohler of Kohler... Regardless of the brand, tubs start at 225lbs, coming in lengths of 4ft, 4.5ft, 5ft, 5.5ft and 6ft, with pedestal tubs available also. Not all feet are interchangeable however we usually do have some options available for you to make the tub truly yours. Click here to see some of our inventory. Q. Do you sell older sinks? A. Yes. Just like our antique tubs, we are proud of our antique sink collection, made by so many brands in so many wonderful styles - Pedestal, wall- mounted, footed, farmhouse... oval, square, rectangle, circular... whatever style you are looking for contact us to see what we have in stock. Q. Do I need to bring anything for a warehouse tour? A. Keeping in mind that it is in fact, a warehouse, please remember to dress weather appropriately if you are coming down for a scheduled tour. There is a small restroom on the premises with the bare necessities for those of you driving a distance (or anyone scheduled on the premises!). If you plan on taking anything home with you, we advise you to bring appropriate padding for the journey such as moving blankets, bubble wrap etc. to protect your piece. Q. Do you make tub sofa's? A. Yes! 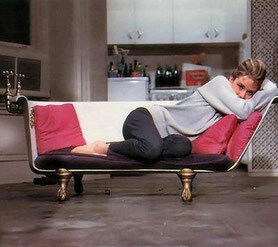 We even supplied a college goer with an exact replica of the first tub sofa seen in Breakfast at Tiffany's with Audrey Hepburn for her replica dorm room! However these tub sofa's, chairs and chaises are not just fantastically stylish pieces for the interior decor, they are also amazingly practical and stylish pieces for the garden or pool area. Not only will they not blow away, but our finishes are UV resistant and so will not yellow out in the sun like the home products sold for DIYers or used by other refinishers, and can take the snow in the winter without hesitation. Tub pet beds will withstand most sized pups and all ideas are a fantastic way to recycle and enjoy the beauty of early hand crafted pieces of history. Any color inside or outside of your choice, just contact us for pricing. Q. What are tub safety conversions/ inserts? Q. Are there other safety options? A. As well as the step-through insert, we can also apply a non-slip finish to the bottom of the tub to help prevent falls while in the tub. This finish can be applied to any color tub and resembles an invisible textured surface to the bottom of the tub, dispelling the need for decals or worse yet, bath mats that your loved one could trip on. Q. Does the tub insert lose the bath function? A. No. If you like, you can choose the basic option of the tub insert with no cap which creates an opening and sits in the wall of the tub. However there is also an extra piece known as a cap (active link), which can be purchased so that the bather can fill the tub with water to enjoy a bath soak. If you have already had the insert applied to you tub and decide that you are missing the bathing function of the tub, simply contact us so that we can order the cap piece for you. Q. Does the tub insert come in different colors? A. The tub safety inserts come in a standard white color. We have installed these in a variety of colored tubs as the home owner is satisfied, or we have also refinished entire tubs in a bright white so that the whole piece resembles one new unit. The choice is completely up to you and your budget. Q. Do you install hand rails? A. While we do not install grab bars ourselves, we do recommend this company operated by a geriatric care RN who assists with elderly care and mobility. Please note that we are not financially affiliated or legally responsible for any issues following the endorsement of this company. Did you not see your question listed above? Write to us and tell us and we will put it up here to assist you and anyone with the same query.